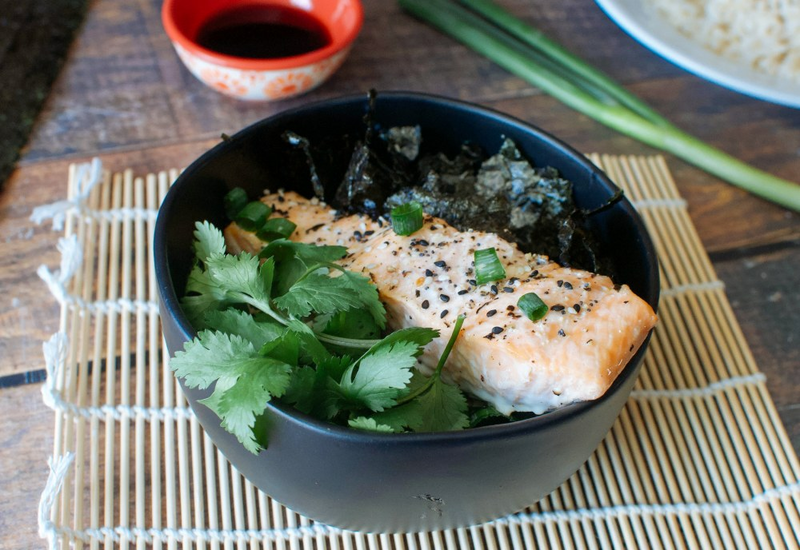 Our delicious Asian-style Buddha bowls are packed with salmon, avocado, green onions, cilantro, and nori (seaweed). This flavorful dish is served with a homemade soy vinaigrette prepared with tamari, mirin, rice wine vinegar, and sesame oil. It is served over a bed of perfectly cooked brown rice and garnished with a flurry of sesame seeds. Believe it or not, this healthy bowl is ready to enjoy in just about half an hour! Salmon is ready when it flakes easily with a fork. You can also use an instant read thermometer to check the fish for doneness. The USDA recommends a minimum internal temperature of 145°F from the thickest part of the fillet. Per Serving: 531 calories; 31g fat; 31.7g carbohydrates; 30g protein; 71mg cholesterol; 725mg sodium. This salmon bowl was really good. I love using the shredded nori! I had some extra strips in my pantry and was glad to put them to use. The soy vinaigrette was also really delicious, perfect for drizzling! These salmon bowls were really good. I've always loved the Asian-inspired flavors when making salmon. The soy vinaigrette was a nice addition too, perfect for drizzling. When I think of Buddha bowls, I think of vegan grain bowls. Not sure what the true definition is, but these are definitely delicious. The only thing that was missing for me in this recipe was more veggies, so I added broccoli and carrots. My one critique, which is in easy fix, is to add more veggies like bell peppers and edamame. It just felt like it was missing something, but once I added peppers and edamame it really helped. The soy vinaigrette was also really good. I did shrimp and salmon both, with all the fixings like avocado, green onions, cilantro, and seaweed. I also just used a simple soy sauce instead of the dressing. Thanks for the idea, I really love the way it turned out.